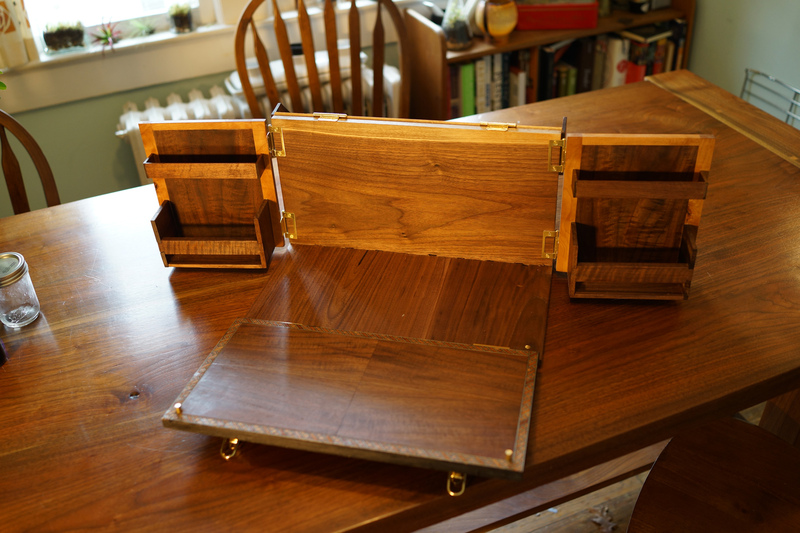 I’ve been interested in campaign furniture lately. 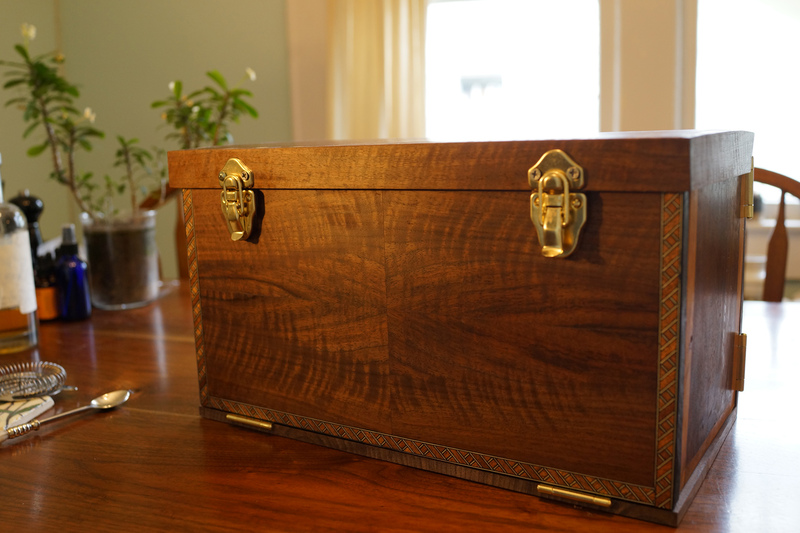 Basically, the officer class during the days of the empires wanted nice furniture to take on campaign tours with them, so they created these beautiful boxes that would pack up into luggage and then unpack into a dresser, a desk, a bar, etc. 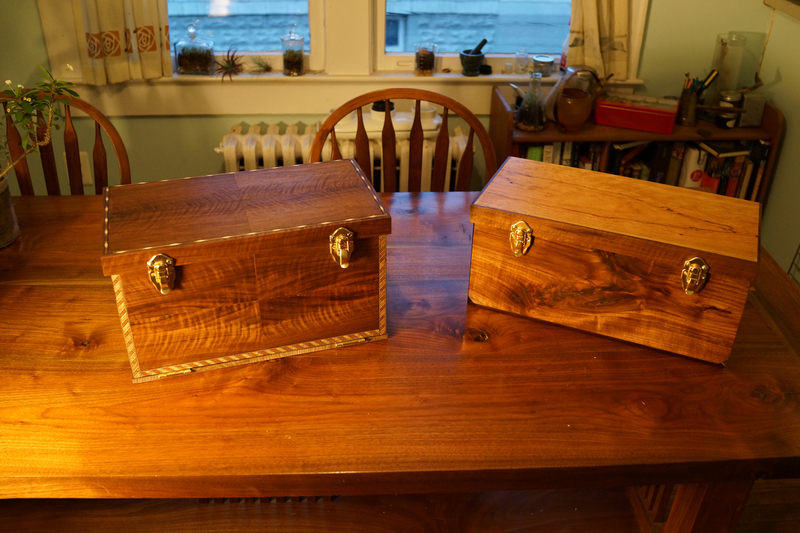 So I made some as presents this year. 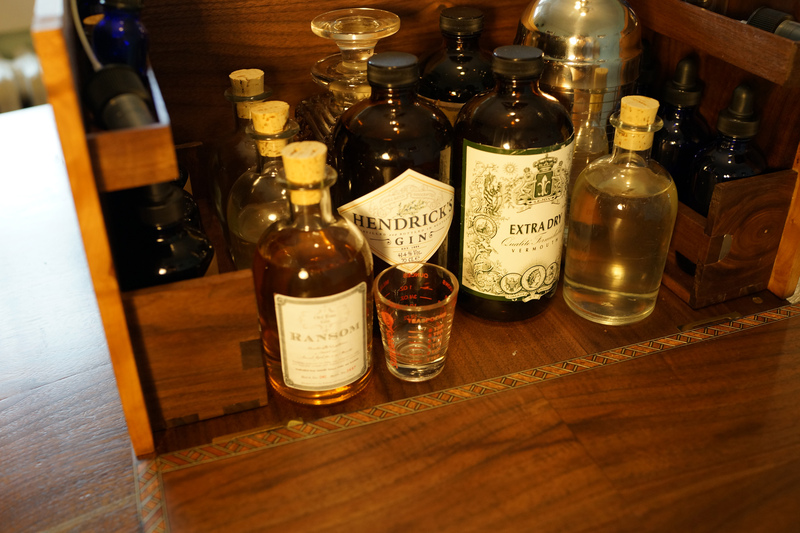 One for drinks, one for tea. Here are some photos of what I came up with. 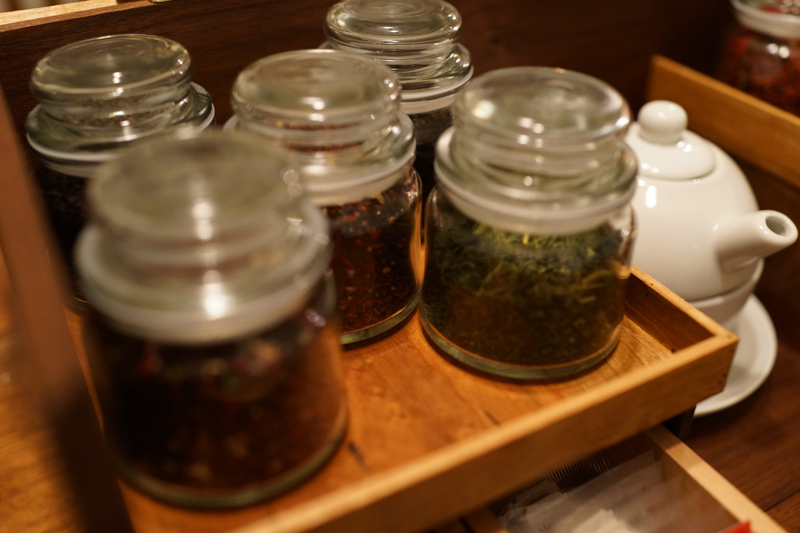 For the tea box, we chose a nice assortment of teas, some from Yekta, our local Persian grocery, some from the Misir Carsisi in Istabul, and some from Capitol Teas, here in DC. 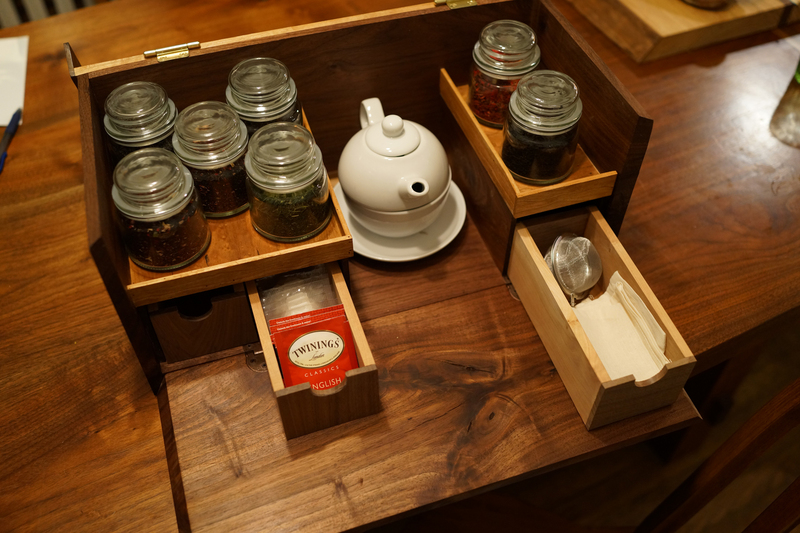 The tea box has 7 types of loose tea, two drawers for tea bags and one for tea tools (sachets, tea strainer, etc) and a teapot-mug combo that sits compact together. 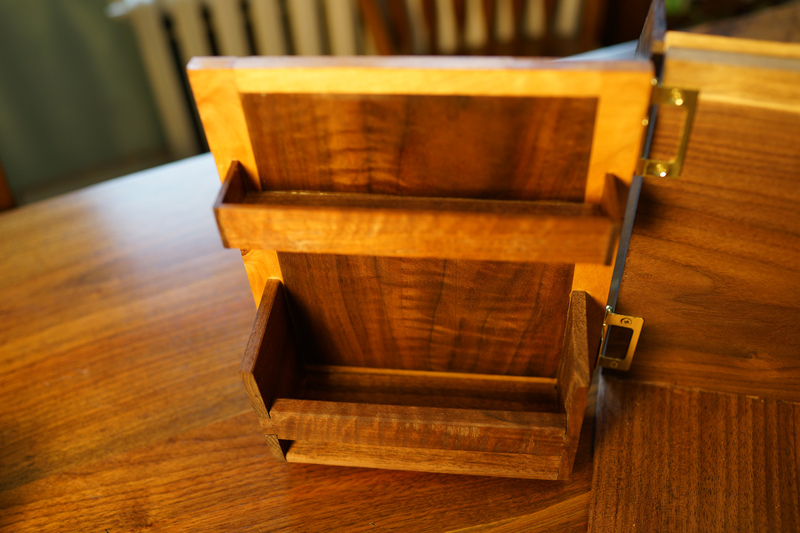 Brass hardware and figured cherry and walnut. 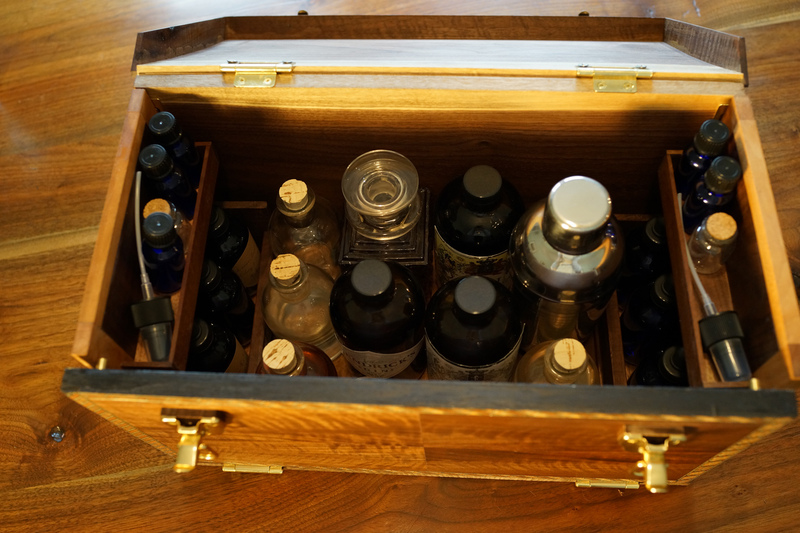 For the bar box, we decided to make 6 types of bitters, so we went to the local potion store on Georgia ave – Blue Nile Botanicals, which is packed floor to ceiling with every kind of root and bark and spice you can imagine. Bitters traditionally are formed from three components: a bark or root (the bitter), a spice, and a fruit. 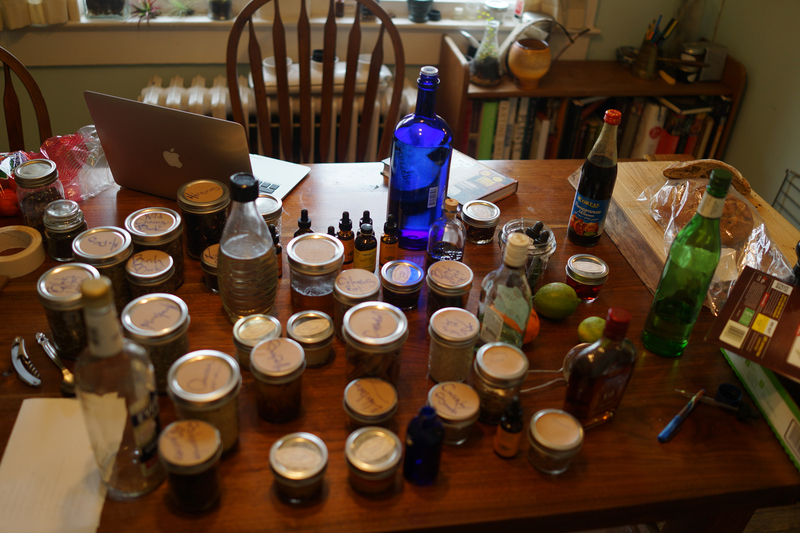 So we infused a variety of spices, roots, and flavors. We mixed them into 6 different flavor profiles, from lime-ancho chile-hibiscus, to ginger-orange. 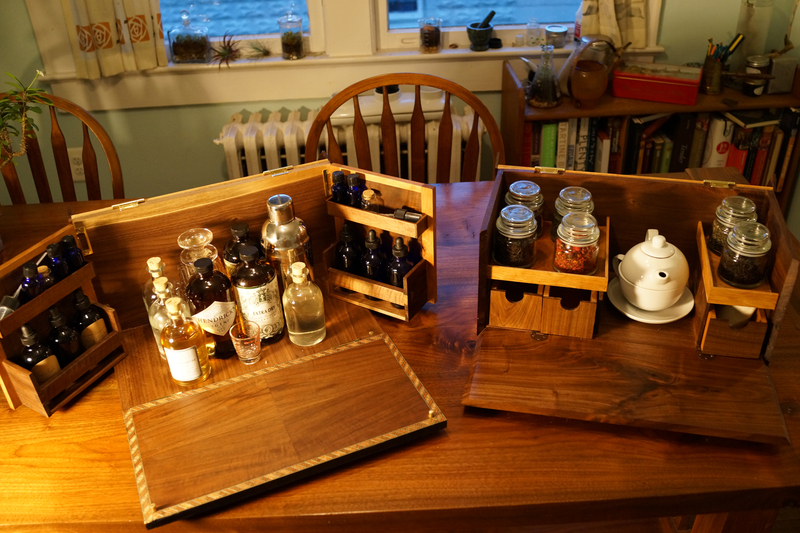 It opened out to have room on the doors for the bitters and a pouring area up front. 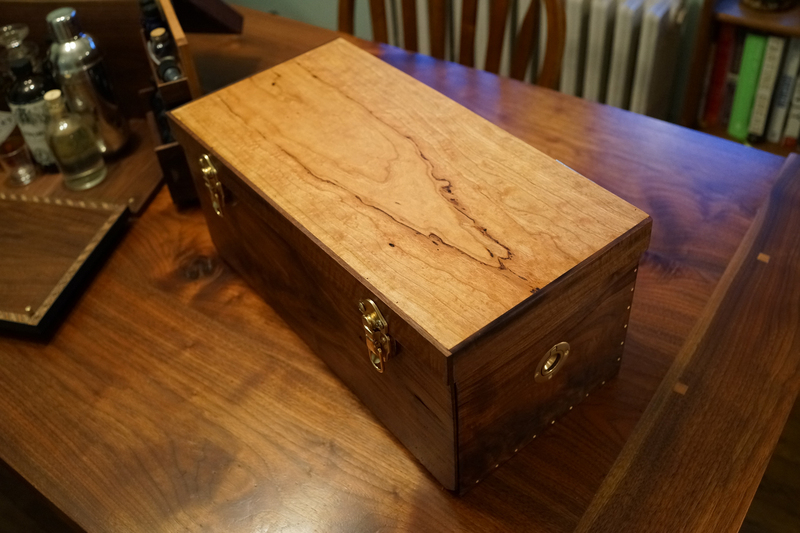 The box was three 4-way bookmatched Bastogne walnut, with inlaid edge banding. All packed. The bitters came both with droppers and atomizers, so you could mist the glass or spray on top of the cocktail, if wanted. 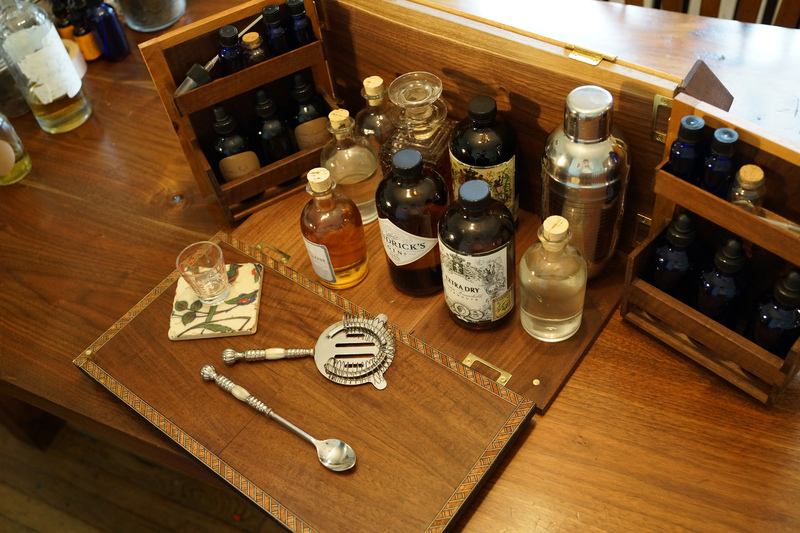 The contents were: Hendricks Gin, Bulleit Bourbon, sweet and dry vermouth, Ransom Aged Gin, simple syrup, the bitters, a shaker, a shot glass, 5 small vials of single flavor infusion, and two extra bottles for whatever other liquor was required. ~ by Josh on February 12, 2014. 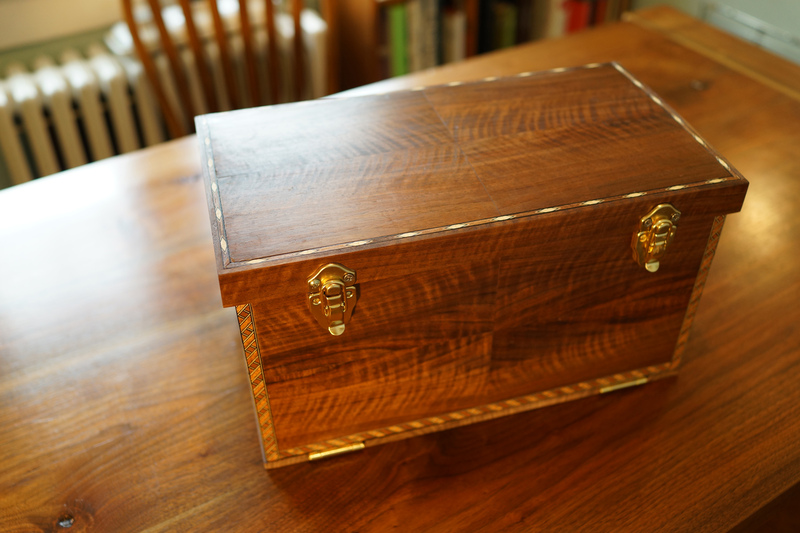 Exquisite workmanship! What a great idea. 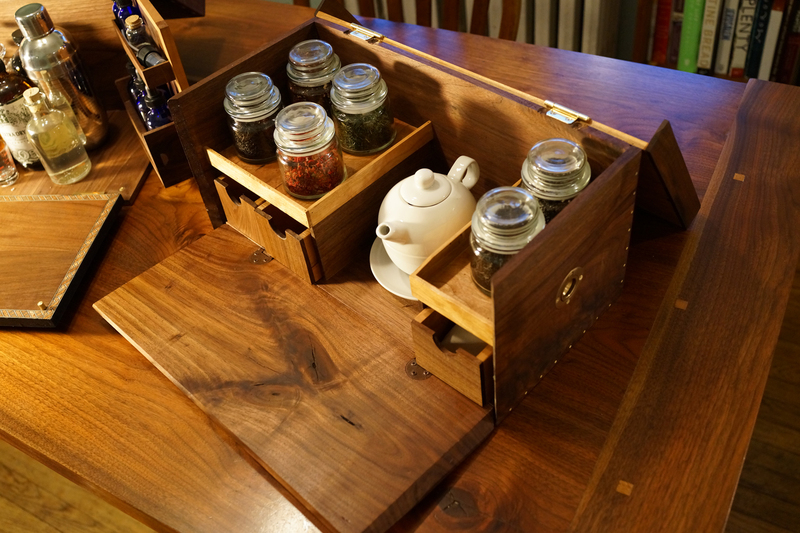 I lust after the tea chest!